Rebellion/2000AD to Reprint Uncensored Version of "Cursed Earth"
While I'm definitely new to the world of 2000 AD/Judge Dredd, I really dig the comics that come from one of the premiere comics anthologies every week, which I write about occasionally here at the site, usually when it's a one-off or a new jumping-on point. I'm still very much a novice when it comes to the classic stories, however. (For example, I just read America this past summer.) So that means I was completely unaware that reprints of Cursed Earth, which I knew by name but not by reading, had been censored after its initial release. Well, that censorship is over! The UK rules on parody have shifted, I guess, so now they can move forward with showing you some alt-comix like moments featuring everyone's favorite square-jawed cop. 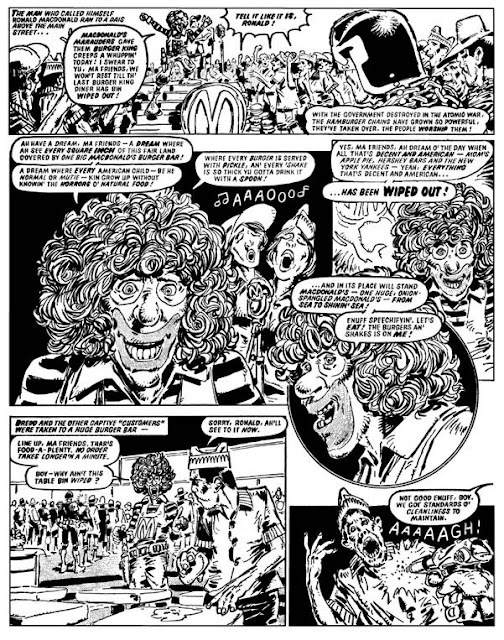 After concerns of legal action at the time the then publisher IPC decided all subsequent collections of this classic strip would omit the satirical stories. Now, following recent changes in UK law governing parody, we’re very pleased to announce that next July, Judge Dredd: The Cursed Earth Uncensored will reprint the story in its entirety for the first time. The new edition will be deluxe and feature the color pages as well, which means that the world will once again get some Brian Bolland work that many have never seen. 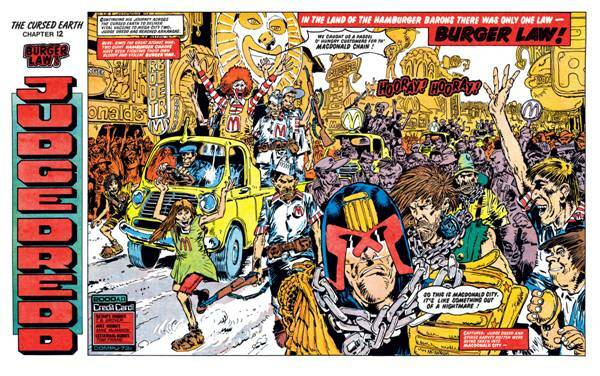 Others involved are Pat Mills, John Wagner, and Mick McMahon. If you've ever read Judge Dredd at all, you know that it's definitely an arrow straight at the heart of America's worst traits, especially its tendency to value security over freedom. Getting an early look at at a lampooning of our corporate culture really appeals to me, and I'm looking forward to seeing this one reach print next year. Here's a few samples, courtesy of 2000AD. Please note that Bolland Jolly Green Giant! Amazing stuff. 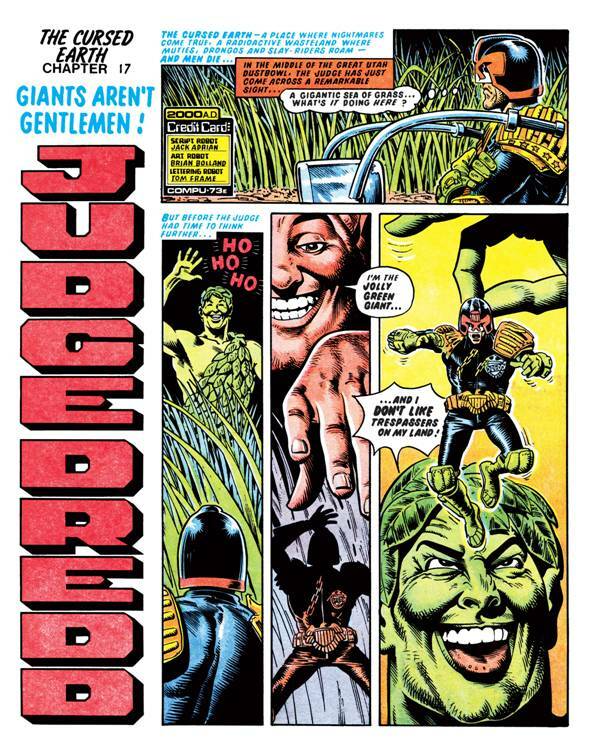 Judge Dredd: The Cursed Earth Uncensored will be out in July 2016. Look for it, creeps!